Move the corresponding front seat forward if necessary. 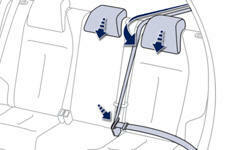 Check that the corresponding seat belt is positioned correctly against the backrest and buckle it. Place the head restraints in the low position. Press control 1 to release the seat backrest 2 . 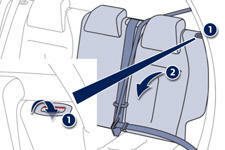 Fold the seat backrest 2 on to the cushion.